Food containers: let’s reduce waste! One tip to reduce your waste is to take your own reusable food containers, along with your reusable shopping bags, when going shopping! 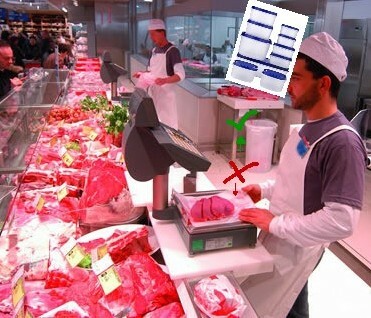 You can take them to the butcher, fish market, deli counter and anywhere else where you can purchase loose products. then into paper/plastic sheets again, then into a plastic bag. The same when buying cheese cut from a large block, ask to put it into your own container. At delicatessen, ask them if you can use your own reusable containers instead of the brittle plastic lidded for items like olive, dried tomatoes, Russian salad. Adopting this style-life you will be pleasantly surprised how the amount of rubbish you put into your bin that ends into the landfill each week will be reduced!. Also the advantage is that your portion are already divided just to put into the freezer and in case of delicatessen food prepared with oil if your containers are well closed no more worries about leaking oil into your reusable shopping bag.